Since 2005, the boys in indie rock band sosaveme have been making music, touring relentlessly and trying to spread their sound and message to anyone interested. The following year saw their first official release, an EP entitled Even The Trees... One acoustic EP and a full-length later, and you have sosaveme in their current state...still making music, touring relentlessly and spreading their sound and message. On October 4, their latest labor of love, The Garden, hit all the major online retailers. As described by the band themselves, The Garden is like a reflection on ourselves when all our ugly sinfulness is showing through. That being said, the lyrics tend to be more on the dark and despaired side, with a focus on how unclean we are as humans. The album's lead-off track, "Gentle Slope," which also serves as the band's lead single, tells somewhat of a story of two people who try desperately to feel alive through temporary pleasures. 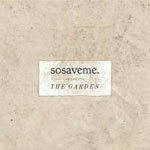 sosaveme recently released a music video on YouTube for the song, which follows along with the darker image The Garden presents. I love the chorus in the track "Wolves." Vocalist Nick Pidek sings words that bring up all-too-familiar feelings: "Am I just dirty on the inside and faking what makes me a man? Am I just looking in all the wrong places to find out who I am?" This sort of weakness is what makes up the majority of the discussions in The Garden. Sometimes they can come off as David-like Psalms, when he spent his time crying to God for rescue and hope. The title track is a great example of the Psalm-like quality, starting out sorrowful and somewhat ending in hope and a remembrance of who God is. Pidek puts himself into the shoes of Adam and Eve in the Garden of Eden. The end of the song shows Pidek feeling ashamed of the mess he made, but then saying, "And You call me by name, You call me by Your name." The fabulous song, "Sender/Receiver," speaks of the importance of loving ourselves if we're ever to grow and move past our failures. Pidek says, "But how can you love anyone when you can't love yourself? It's a lie to beleive that we'd ever amount to anything if we can't learn to just forgive ourselves, from the damage we've done to all that we say we love, if only grace could find its way into our wicked hands." Such an important message that we forget all too often. Musically, the album is a real treat. It starts off with an indie rock feel, mixed with a pinch of something along the lines of A Rotterdam November. The rest doesn't really have any ARN touch, but rather, sosaveme plays indie rock music a la so long forgotten or As Cities Burn (without the screaming). Pidek's vocals work wonders with the music, having a passion for what he's singing about that shows, without straining his voice so much that it becomes unappealing. He also plays guitar alongside guitarist Justin Ozanich and bassist Austin Germain. They really have a terrific chemistry that results in wonderful guitarwork--from riffs that drive the song, to wandering guitarlines during the contemplative portions, to soft strumming when appropriate. On the drums is Jon Moore; along with providing some background vocals, Moore follows along with the feel of the songs perfectly, without ever sounding like he's just following along. All the bandmembers know their parts in the songs, but it's like they never feel confined by them. In addition, there's a cool appearance from Mike Mains (vocalist for Mike Mains and the Branches) in the song "Sender/Receiver." I thought it was Micah Boyce from so long forgotten at first, but sosaveme confirmed it was Mike Mains. I've heard great things about MMATB, and this spot here was enough to convince me to check out their album. Mains complements the song so well, making it even better than it already was. For a band with several albums and years of playing to their names, I'm a little surprised to have never heard of sosaveme until The Garden. Even more surprising was how good it is (you would think there was a reason no one had heard of them, right?) However, The Garden is excellent. Lyrically, it's real, honest and convicting. Musically, it's engaging and very well-written. It's not a new sound by any means, but it's one that so few are doing (doing well, at least). I definitely recommend The Garden if you're into the indie rock scene.